Still, thirty enjoyable minutes is better than fifty minutes of flab, and the band's typically solid songwriting is present and correct. I'm admittedly a fan, and it's always good to hear more from them, especially when as naturally catchy as usual. The nine songs here fit well into the band's discography; opener Freja's Choice is possibly the best track present, an enjoyable semi-Viking stomper with an extended melodic second half verging on the proggy at moments. Born For Battle has an enjoyable 80s Judas Priest feel, Master of the Land and Last One to Fall fairly typical power metal with a slight edge, while Frost and Fire goes for outright groove and does it very well. This sort of metal is easy to enjoy, but equally easy to criticise as it's nothing new and only really noteworthy because it's Grand Magus making it. In addition, there are a few moments that verge on being a little too cheesy; Varangian's 'warriors of steel' refrain and the 'viking metal' chorus in Forged In Iron – Crowned In Steel especially pandering to the true metal crowd. Still, Christofferson's vocals carry most of it, and there's no denying that Grand Magus are very good at making easily listenable heavy metal. And with final track Every Day There's A Battle to Fight going beyond ridiculous and out of the other side with lyrics about fighting and not letting fear stand in your way, we may even have a new Manowar on our hands! 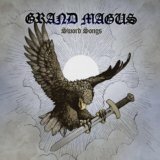 Other Grand Magus albums are undoubtedly better, and I'm sure I'm not alone in wishing they'd make their music more violent instead of merely singing about it, but this will please fans and those who loved Triumph and Power will find much to like here, if less of it than they're used to.